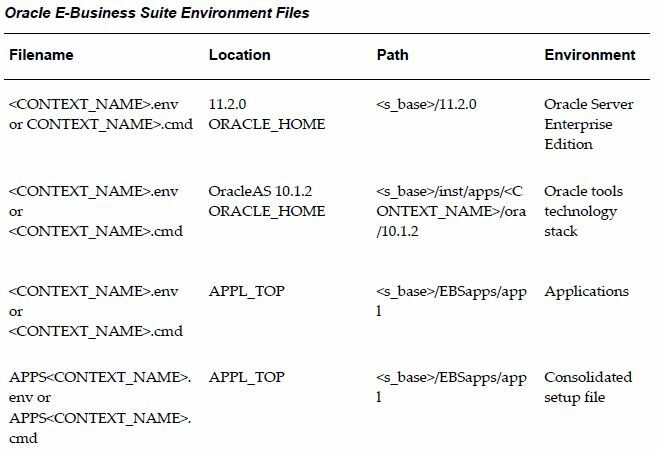 Oracle E-Business Suite Release 12.2 has seen significant changes to the locations under which log files are stored. In large part, this is because of the introduction of online patching and the additional file systems it employs. The adoption of Oracle WebLogic Server for some configuration management tasks has brought its own log file requirements, over and above those of the traditional AutoConfig tool. • HTTP log files are located under the native instance home. • Oracle WebLogic Server log files are located under the domain home. The AutoConfig log files are stored under <INST_TOP>/admin/log/<MMDDhhmm> on the Application tier, and <RDBMS_ORACLE_HOME>/appsutil/log/<CONTEXT_NAME>/<MMDDhhmm> on the Database tier. Rapid Install creates several environment files that set up the Oracle database, Oracle technology stack, Oracle HTTP server, and Oracle E-Business Suite environments. <s_base> is the directory where the EBSApps, 11.2.0 (database), inst, and FMW_Home directories exist. APPLFENV The name of the environment file, <CONTEXT_NAME>.env. If you rename the environment file, this parameter setting must be updated. PLATFORM The operating system in use. The value (for example, LINUX) should match the value in the $APPL_TOP/admin/adpltfrm.txt file. APPL_TOP The top-level directory for this Oracle E-Business Suite installation. ADMIN_SCRIPTS_HOME Directory under $INST_TOP that Identifies the location of scripts such as adautocfg.sh,adpreclone.sh, adstrtal.sh, and adstpall.sh. FNDNAM The name of the ORACLE schema to which the System Administration responsibility connects. The default is APPS. GWYUID The public ORACLE username and password that grants access to the Oracle E-Business Suite initial sign-on form. The default is APPLSYSPUB/PUB. FND_TOP The path to the Application Object Library directory. For example, /u01/R122_EBS/EBSapps/appl/fnd/12.0.0. AU_TOP The path to the Applications Utilities directory. For example, /u01/R122_EBS/EBSapps/appl/au/12.0.0. <PROD>_TOP The path to a product’s top directory. There is one entry for each Oracle E-Business Suite product. PATH Sets the directory search path, for example for $FND_TOP and $AD_TOP. APPLDCP Specifies whether distributed concurrent processing is being used. Distributed concurrent processing distributes processing load across multiple concurrent processing nodes. APPCPNAM Indicates whether the format of the concurrent manager log and output files follow 8.3 file name conventions (maximum of 8 characters to the left of the dot and 3 to the right; for example, alogfile.log). If this parameter is set to “REQID” (required), the concurrent manager uses file names that meet 8.3 naming requirements. APPLCSF Identifies the top level directory for concurrent manager log and output files if they are consolidated into a single directory across all products. For example, /u01/R122_EBS/inst/apps/<context_name>/log s/appl/conc. APPLLOG The subdirectory for concurrent manager log files. The default is log. APPLOUT The subdirectory for concurrent manager output files. The default is out. APPLTMP Identifies the directory for Oracle E-Business Suite temporary files. The default is $INST_TOP/appltmp on UNIX. APPLPTMP Identifies the directory for temporary PL/SQL output files. The possible directory options must be listed in the init.ora parameter utl_file_dir . INST_TOP Identifies the top-level directory for this instance. For example, /u01/R122_EBS/inst/apps/<context_name>. Introduced with Release 12.0. NLS_LANG The language, territory, and character set installed in the database. The default for a fresh install is “AMERICAN_AMERICA.US7ASCII”. NLS_DATE_FORMAT The National Language Support date format. The default is “DD-MON-RR”, for example 29-JUL-11. NLS_NUMERIC_CHARACTERS The National Language Support numeric separators. The default is “.,” (period and comma). Most temporary files are written to the location specified by the APPLTMP environment setting, which is set by Rapid Install. Oracle E-Business Suite products also create temporary PL/SQL output files used in concurrent processing. These files are written to a location on the database server node specified by the APPLPTMP environment setting. The APPLPTMP directory must be the same directory as specified by the utl_file_dir parameter in your database initialization file. Several other environment files play a key role in an Oracle E-Business Suite system. The adovars.env file, located in $APPL_TOP/admin, specifies the location of various files such as Java files, HTML files, and JRE (Java Runtime Environment) files. It is called from the main applications environment file, <CONTEXT_NAME>.env. The adovars.env file includes comments on the purpose and recommended setting of each variable. In a Release 12.2 environment, adovars.env is maintained by AutoConfig, and should not be edited manually. AF_JLIB Indicates the directory to which all Java archive files are copied. For example, /u01/R122_EBS/EBSapps/comn/java/lib. JAVA_BASE Indicates the top-level Java directory. For example, /u01/R122_EBS/EBSapps/comn/java. JAVA_TOP Indicates the directory to which all Java class files are copied. For example, /u01/R122_EBS/EBSapps/comn/java/classes. OA_JAVA Indicates the directory to which all Java archive files are copied. For example, /u01/R122_EBS/EBSapps/comn/java/classes. OA_JRE_TOP Indicates the location where the JRE is installed. For example, $FMW_HOME/jdk/jre. OAH_TOP Defines the location to which HTML files are copied. For example, $FMW_HOME/Oracle_EBS-app1/applications/oacore. OAD_TOP Defines the locations to which context-sensitive documentation files are copied. For example, /u01/R122_EBS/EBSapps/comn. LD_LIBRARY_PATH Path used on many UNIX platforms to list the directories that are to be scanned for dynamic library files needed at runtime. CLASSPATH Lists the directories and zip files scanned for Java class files needed at runtime. AD utility programs perform a variety of database and file management tasks. These utilities need to know certain configuration information to run successfully. This configuration information is specified when Oracle E-Business Suite is installed, and subsequently stored in the adconfig.txt file in the $APPL_TOP/admin directory. Once it has been created, this file is used by other Oracle E-Business Suite utilities. 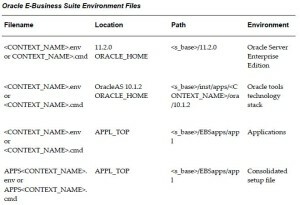 This file sets additional environment variables used by the Oracle Application Object Library. For example, it sets APPLBIN as the name of the subdirectory where product executable programs and shell scripts are stored (bin). This file should not be modified: the default values are applicable for all customers. The file is located in the FND_TOP directory. This file sets variables that let you link third-party software and your own custom-developed applications with Oracle E-Business Suite. This script is located in FND_TOP/usrxit, and is automatically called by fndenv.env. This allows you to compile and link custom Oracle Forms user exits and concurrent programs with Oracle E-Business Suite.